I am proud to report that I actually read this entire book in less than 16 hours (and that included sleeping time)! This wasn't done deliberately, but I am feeling pretty accomplished just the same. 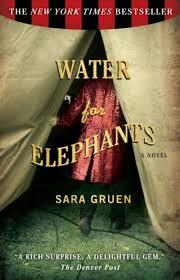 Water For Elephants by Sara Gruen is the story of a young man named Jacob in the 1930s who inadvertently runs away and joins the circus. He has just lost his parents and all of their possessions with them and decides to hop a train one night only to discover it is The Great Benzini Brothers Circus train. He had studied as a veterinarian in college (though he did not finish his final exams), so he is hired and helps care for the animals but pitches in wherever else he is needed as well. Jacob is introduced to a lifestyle he never dreamed of as well as the love of his life, Marlena. Their story is tumultuous to say the least due to Marlena's husband, an inconsistent maniac who you never quite know if he is angry or happy as he flips quickly between is emotions. Jacob and Marlena do not acknowledge their mutual interest in each other at first due to Marlena's marriage, but as things become worse the two of them are thrown together irrevocably with the help of Rosie, the elephant they train. The two young people make the best of their situations as they come and could never imagine how they end up.